If you ever needed a freeze frame on the volatility of closers, you’re seeing it in Washington right now. Joel Hanrahan lost the job quickly, but not as fast as Manny Acta’s closer-in-waiting Garrett Mock. Instead we are told to expect a committee consisting of Julian Tavarez and Kip Wells. Until next week when Joe Beimel will come off the disabled list and either “join the mix,” or supplant those co-closers. And don’t forget that a year ago today, Chad Cordero was still active and supposed to eventually swap jobs with his impermanent replacement Jon Rauch. It is not just franchises in chaos that remind us of how, if all managers are interim, then all closers (except, perhaps, Mariano Rivera) are temporary. Since Bobby Cox returned to the helm in Atlanta in 1990, this has been the succession (and I’m deliberately ignoring a couple of “closers for a week” like Joe Hesketh). And they won stuff during that merry-go-round. Moreover, Gonzalez is formally Cox’s closer at the moment. Yet only last night did he pull out of a tie with Soriano for the team lead. Well here’s the oldest time-waster by a blogger: ballplayers who look like actors. But I think three of these are new; certainly two of them are bizarre. Khalil Greene and Sean Penn as Spicoli from “Fast Times At Ridgemont High” – observed first, I think, long before Greene made the majors. But what about Rocco Baldelli of the Red Sox and the actor Aidan Quinn? This one jumped off the scoreboard at the Mets-Nats game Saturday. The new official publicity photo of Adam Dunn, and Will Ferrell? And my favorite, applying only when he has that lip-curl snarl while at bat, somewhat enhanced by the Yankee colors: Mark Teixeira and Little Steven Van Zandt in his “Sopranos” role of Silvio Dante? Did you know Danny Elfman was a famous 17th century classical composer? I knew I’d heard it in the Pee Wee Herman movie. That’s because it’s part of the soundtrack of the Pee Wee Herman movie. Well thank goodness that’s over. Firstly, I believe they may be, in no particular order, Russ Ohlendorf, Justin Maxwell, Micah Hoffpauir, and Jonathon Niese. Ohlendorf, as alluded to previously, is your early frontrunner for the emergent starter of 2009 after his efficient work against the Padres (and apparently not mixing in his curve until his last inning; sliders and fastballs exclusively, previously). Maxwell, as alluded to previously, will probably have to get an audition in the Nats’ outfield after beating up the Mets today with a couple of singles, a couple of steals, and a couple of RBI. Hoffpauir, as alluded to previously, would get any time Derrick Lee misses after neck spasms forced him out this afternoon. And Niese would probably get the first shot at what may soon be an opening in the Mets’ rotation after the latest Oliver Perez “Human Torch” act. The rest of the answers are from your posts. As mentioned earlier, political ones will be ignored (this is a politics-free zone) and abusive or irrelevant ones ignored. And we’re still looking for somebody to identify the snippet of classical music used by the Yankees during the otherwise intolerable “Great Subway Race” on their scoreboard in the brand new Empty Stadium. If I am correct, Bill Sharman was sitting on the Dodger bench during a big argument and the plate umpire–if memory serves it was Frank Dascoli–cleared the bench, meaning Sharman never played in a major league game but got thrown out of one..
You are correct sir, September 27th, 1951, and the very irascible umpire was Frank Dascoli. So Sharman saw a lot of action during his month in the majors, between that and the Dodgers-Giants playoffs. He just didn’t get to appear in any action. The new stadium is across the street (admittedly a very wide street) from the old stadium. Things can be weird in this city, but major atmospheric changes crossing 161st Street isn’t one of them.�I’d say lousy pitching is the more likely answer. This one is about the outbreak of homers at Empty Stadium. The geographical point is correct; several hundred yards north and about a hundred west of the old location should not create a wind tunnel. But this isn’t about geography, it’s about architecture. 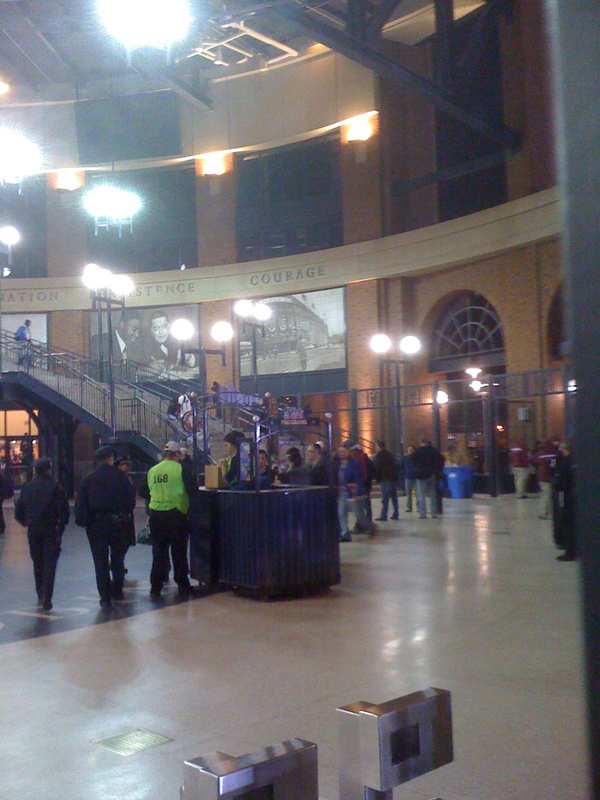 The wind tunnel is not natural, it’s man made, most likely by the open-air ring in the upper deck (replacing what had been solid wall in the old place) and the giant open-air entrances down the first and third base lines. 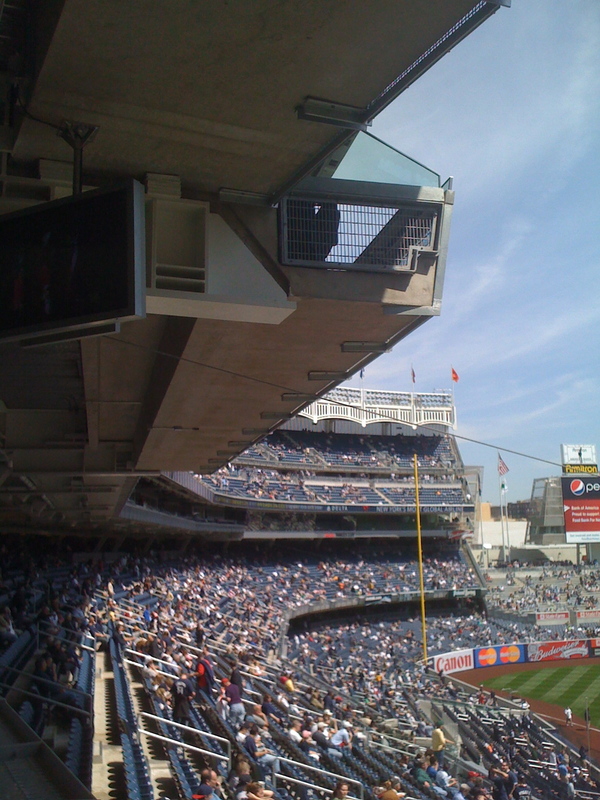 The new Yankee Stadium is at the mercy of air flow that was walled off across the street. Whatever it is, it seems to remain in effect. This refers to a photograph from opening day. That is not in fact a Super Bowl media credential around my neck. It is a Super Bowl laniard. Apart from the phenomenal price changes, the biggest switch in the new park is the number of times one is forced to present one’s ticket. So I needed something to carry it in, and that’s what I happened to have lying around. So that “Natinals” thing across Adam Dunn’s Washington uniform this past week? That wasn’t a misspelling. That was an alias. Membership on the Washington National League team right now would make any player try to pretend otherwise. Firsthand exposure to the Nats shows that ex-General Manager Jim Bowden has left another franchise in tatters, at least in the short-term. The outfield is a defensive mess, the infield wobbly, and the ace of the pitching staff makes his second major league start tomorrow. Elijah Dukes nearly got himself killed on David Wright’s first-inning fly ball at CitiField this afternoon. Sunglasses still perched atop his cap, Dukes missed catching the ball by about three inches, and missed getting conked in the noggin by the same measurement. The presumed good news is that if Lastings Milledge was still playing center for Washington, the ball would’ve landed 40 feet behind him. Dukes’ glasses were down in time for him to see, but not catch, Daniel Murphy’s fading fly in the sixth. Dukes slid, and the ball hit him in the glove. Murphy was credited with a single, presumably because, given how he plays the outfield, Dukes’ glove is considered part of the field of play, and not an actual piece of equipment. Even Nick Johnson threw away a Mike Pelfrey sacrifice bunt in the third, and just for good measure back-up catcher Wil Nieves tried to gun down David Wright by throwing the ball to Dukes in the sixth. Starter Daniel Cabrera gave up five runs – only one earned, though the six hits and four walks were his problem. This is not to say the Nationals are hopeless. No one who has seen him doubts Jordan Zimmermann is the real thing, and even with only Dunn to protect him, Ryan Zimmerman went 2-for-5 and was robbed of a third hit only by a Daniel Murphy slide that actually worked. Jesus Flores is one of the game’s most unsung two-way receivers, and Joel Hanrahan may have straightened himself out. One of the intriguing questions facing new GM Mike Rizzo and the able and somehow-still-sane manager Manny Acta is whether or not to offload some of their supply of generic, identical outfielders (the A) Austin Kearns, Josh Willingham kind, and the b) Dukes, Lastings Milledge kind) and give Justin Maxwell a serious look in center. The recuperating former top prospect smoked a Brian Stokes fastball in the ninth off the top of the wall in right-center (in any other park it would have been an easy and a frightening homer). On the off-chance that Dukes might be convinced to pay attention and handle leftfield, and accepting Dunn as a necessity in the line-up, why not try Maxwell in center, and see if anybody wants any of the others. Well, not really, but his name came up on the field before the Mets and Nats played, and it permits me to address the dumbest of my Dumb Obsessions, and solicit your help. Huckle was one of the two earliest products of the Met farm system to be summoned to the majors, from the low minors, in September, 1963. The other, Cleon Jones, was absolutely overmatched (.133 in six games). But Huckle fared far worse. A shortstop, he didn’t get into a single game, and never got another chance. His remaining claim to fame would be as Tom Seaver’s first professional roomate (Seaver said he never saw him awake, not once in any hotel room they shared – Huckle was an early riser who was dedicated to long walks at dawn). I had heard of Huckle, but never of his fruitless cameo, until today. Photographer Steve Moore insists he was at several Mets’ games (and has the scorecards to prove it) with Huckle listed on the roster. Huckle would thus becomes the 51st member of the Bill Sharman Society, my list of players who can be proved to have been on major league rosters, but who never played in a major league game. The Elias Sports Bureau calls them “Zombies” but that doesn’t quite capture their sad fates. Sharman, of course, is the basketball Hall of Famer who originally doubled as a top outfield prospect for the Brooklyn Dodgers. After a stellar season in the minors, he was summoned to Ebbets Field in September, 1951, and spent the rest of the year on the Dodger roster. He never got a moment’s action – although one of the games he didn’t play in was that featuring Bobby Thomson’s famous homer. 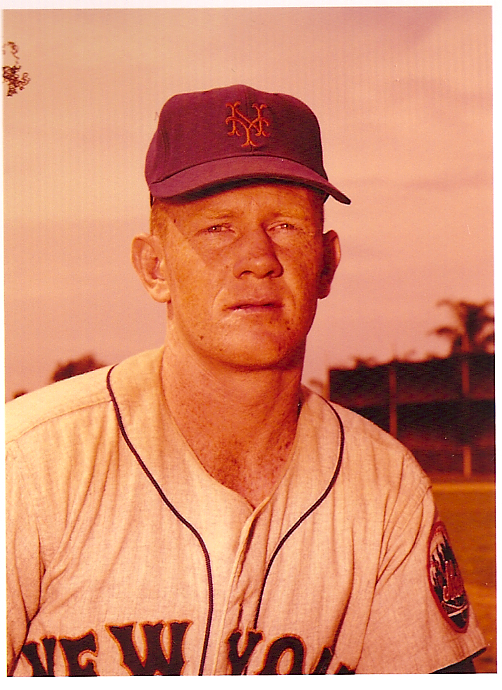 Wilbur Huckle, in spring training with the Mets in 1964 (no, there wasn’t an ion storm – age has withered the negative and thus my only copy of the print). In any event, if you have any nominations for the Sharman Society, put them in the comments and I’ll be happy and grateful to research them. Again, not a complaint, just a laugh. And a possible explanation if a reporter tells his office he really didn’t see the pitch. Or the batter. Or the umpire. less), walked, then lifted a sacrifice fly to put his team back in front. Wang is just fine – there’s nothing to see here. awhile so he can breathe, before they stick him back under the water? By the way, the title of this post is facetious – it comes from an obscure reference in the movie “All About Eve.” No actual confidences were violated in the writing of this blog. Hats off to Ben Erdel. As part of his big night at Yankee Stadium last night, Brett Gardner let one of his Louisville Sluggers fly into the stands. Mr. Erdel and a much younger gentleman both had their hands on the rare souvenir – although only the younger gentleman had just managed to avoid getting hit with the helicoptering bat. Mr. Erdel took the bat, took a few steps, and then thought better of it, and generously did the right thing. The younger gentleman now has a singular thrill from his first Yankee homestand, exceeding his previous one – being my nephew. 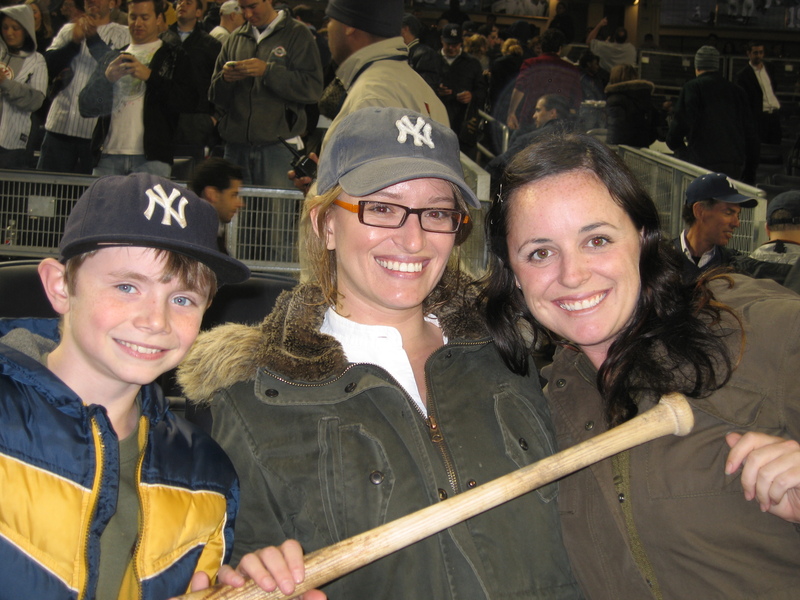 Here is Nephew, Jacob Smith, far left, and his bat, which was not stolen by either Katy Tur or Maegen Carberry. And here is Mr. Erdel, whose second prize is a blog posting (and a clear conscience, and one happy kid left in his wake). Thank you, Sir. As much as all of us adhere to April as a time of rebirth in our shared game and the greater life it symbolizes, the month can just as easily take away, as give. Remember John McSherry? A wonderful man, that rarest of umpires beloved by players even if they thought he missed a call, dead on Opening Day in Cincinnati, dying as he prepared to do what he loved. And this year, today, it’s Harry Kalas, the gifted and unmistakable voice of the Phillies, who collapsed and died just before the team’s game in Washington this afternoon. Of his endurance and wisdom and style, you probably knew – over nearly 45 seasons he had grown into the league of the Scullys. 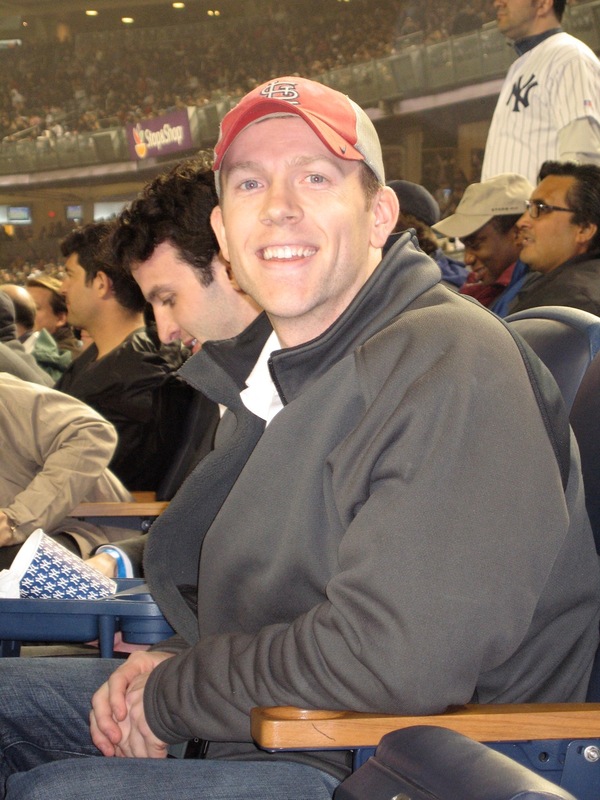 I can also say, having known his son Todd, first of the Mets and now of the Rays, nearly as long as I knew Harry, that Harry must’ve been a pretty good parent, because Todd’s as good a guy as you’d want to know. 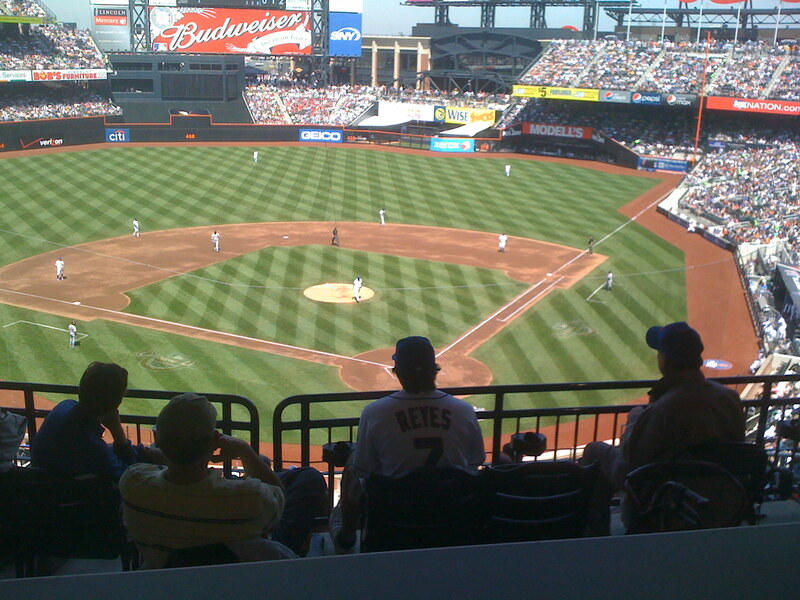 Two new major league ballparks, opening in the same city, in the same week. Hard to believe, never to be duplicated. Not counting the other time it happened. In New York, no less. With one of them being built for the Mets. We have to be a bit generous in our geographical definitions (“New York” consisted only of Manhattan until 1898 when Brooklyn, Queens, Staten Island, and Richmond were merged in as part of “Greater New York”). And we have to be a bit generous in our stadium definitions (a 19th Century “major league ballpark” could be constructed in a manner of days). 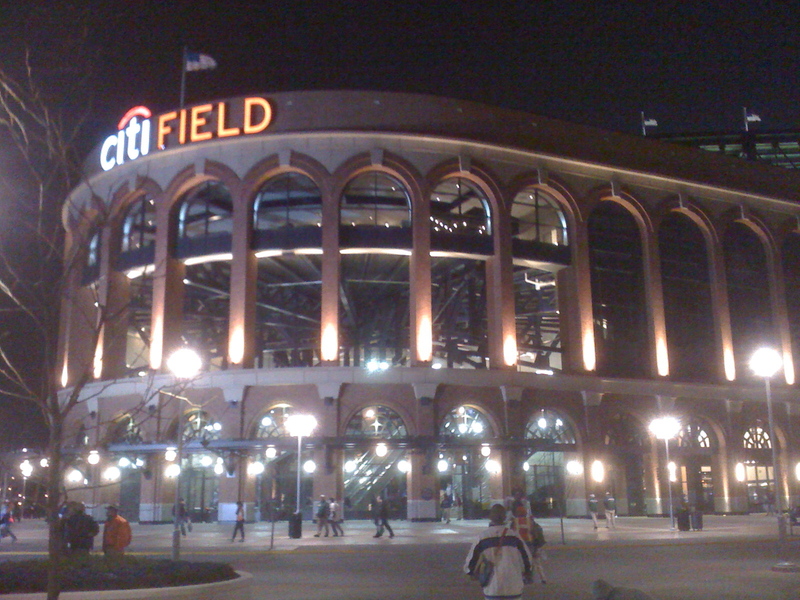 Nevertheless, on Thursday, April 22, 1886, Erasmus Whitman, owner of the original New York Mets, opened his magnificent new stadium for the American Association club at the former St. George Cricket Grounds on Staten Island (a stone’s throw from the current ballpark of the Yankees’ A-ball affiliate). Whitman owned the Staten Island Ferry and the ballclub was just another draw to get people to ride it. On Sunday, April 25, 1886, the Mets’ American Association rivals in Brooklyn opened brand new Ridgeway Park, a facility they would use only on Sundays. Two parks in four days, just like the Yankees and Mets are doing this week. For the record, a quick thumb through Philip J. Lowry’s bible of baseball stadia, Green Cathedrals, the “two new parks, one city” trick also happened on at least two other occasions. In 1884, Boston’s Union Association team unveiled two different new fields, Dartmouth Street Grounds (April 30), and Congress Street Grounds (date unknown). And in 1889, the Giants opened the first of the three versions of the Polo Grounds at 155th Street and Eighth Avenue in New York. Weeks later, Brooklyn’s Washington Park burned to the ground and was rebuilt very promptly as an enlarged and significantly changed facility, also called Washington Park. Again, two new parks in the same city in the same year. I hope to bring you extensive, irrelevant, snapshot filled coverage of the startups at Citifield and Yankee Stadium Junior in this space. My mother passed away Saturday night. This remembrance is not going to be a medical history – though lord knows Mom was the world’s foremost authority on her own health. Nor is it going to consist of me telling you she was the proverbial saint; although I can hear her saying: “go ahead; I‘m not going to disagree with you.Who’s going to contradict you?“ It is not going to be a full biography – suffice to say she was a gifted pre-school teacher and a legendary authority on opera and, somewhere, she is going to be genuinely disappointed that I didn’t get Placido Domingo to sing at the memorial service.I thought instead it was best to focus on something for which she became, and remained, pretty famous, literally until the day she died. My mother was one of the best-known baseball fans in this country. She attended Yankees from 1934 through 2004, and she watched or listened to every one she didn’t go to, up until last month. My guess is, she went to at least 1500 of them, most in Box 47E in the suddenly “old” Yankee Stadium. As recently as March 13th, Mets Manager Jerry Manuel came over to me before his team’s exhibition game against the Tigers in Lakeland, Florida, and asked me how she was. He was the fifth or sixth active baseball figure to do so, this year. They have averaged at least one or two a month, for nearly a decade. Last Saturday afternoon, not six hours before Mom died, a New York Yankees executive made reference to that which had made Mom famous in the ballparks. And trust me: Mom loved being famous in the ballparks. Even if that fame had to be achieved in the way it was, on June 17th, 2000, when the sudden, and growing, inability of the ill-fortuned second baseman Chuck Knoblauch to make any kind of throw, easy or hard, to first base, culminated in him picking up a squib off the bat of Greg Norton of the White Sox and throwing it not back towards first, but, instead, off the roof of the Yankees’ dugout where it picked up a little reverse english and smacked my mother right in the bridge of her glasses. Chuck was in the middle of losing his beloved father at that time and though I thought I “got” what that meant to him, I didn’t really understand it until today as I wrote this, and struggled to find the right keys, let alone the right words. In any event, for three days in 2000, Mom was on one or both of the covers, of The New York Post and The New York Daily News and Newsday. She was somewhere in every newspaper in America. And all this happened, while I was the host of the Game of the Week, for Fox. Literally sitting in a studio in Los Angeles, watching a bank of monitors with a different game on every monitor and recognizing instantly what must have happened (based on a lifetime of knowing the camera angles in the ballpark in which I grew up). I said, maybe too matter-of-factly, “that probably hit my mother.” The crew laughed and I repeated it. More laughs. Then the next shot was of an older woman being led up the aisle towards an aid station – my mother. The next week we pre-taped an interview, me in our L.A. studios and Mom in my childhood home (the photo of her above is from that conversation, and my thanks to my old boss at Fox Sports, David Hill, for letting me re-run the interview tonight on tv). I concluded it by noting my status as a memorabilia collector and asked her if she’d give me the baseball with which she was hit. She said I could bid on it like anybody else. For the rest of the year, any time Fox broadcast a game from Yankee Stadium, Mom got on tv. We even talked about her during the World Series broadcasts that fall, during which began the ritual that continues still: players – players who were at the game, players who only heard about the game, players of all kind – ask me about my Mom. Since the day it happened, I’ve been told Chuck Knoblauch has been mortified by it. Chuck: give yourself a break.You made her famous. She loved it. She couldn’t have been happier if they had let her pinch-hit for you. A full circle, that is. It was my mother who was the fan in our family. My Dad likes the game enough, but the Yankees traded his favorite player and he’s still mad at them. This happened late in 1948. But it was Mom who introduced me to the game, and in my teenaged years when we went nearly every day, it was she who trundled me and my sister to the ballpark. It was on her tv that I came to love the sport, and by her side that I began to understand it. And, sitting next to her, that I began to understand that I was not going to be any damn good playing it and if I wanted “in” – maybe I’d better try talking about it. Thus was born a career, the results of which you see now. At least half of the ham comes from her – she was an aspiring ballerina – and when I keep talking and talking – for good or for ill – that’s pretty much all her. What I don’t have evidence of, are the thousand hours she spent driving me to and from school so I could work on the newspaper or announce the hockey game. In retrospect it’s obvious she was – to adapt a phrase — a Media Mom. 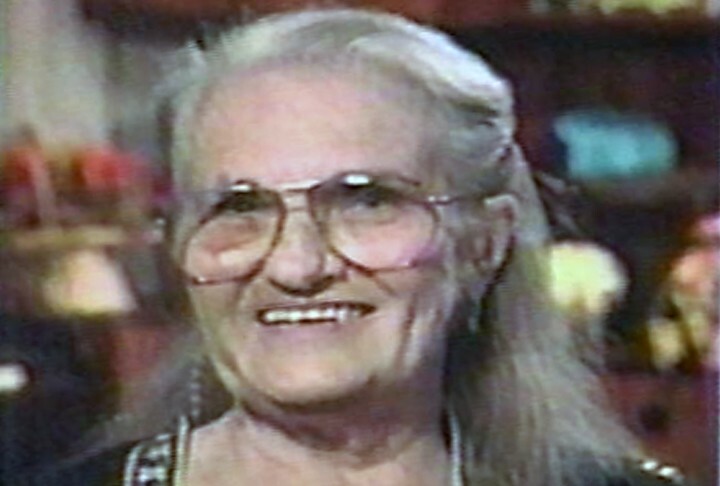 It was the proverbial “sudden illness” – in the best of senses: She had no apparent symptoms until two weeks ago; she was not severely afflicted until ten days ago; the treatment she received lessened her pain; and she never awakened and thus never had to hear – nor did any of us have to say – you have terminal cancer. I’m not going to end with a harangue about how you need to go see your doctor (because not feeling so bad does not mean you aren’t sick) though you should keep that in mind. Knowing that those who have watched or read my work have always overwhelmed me with their support, and how personally they take all this – if you are so inclined, instead of flowers or cards, make a donation to the Susan G. Komen Breast Cancer Foundation, or St Jude’s Hospital, they do such important work there. 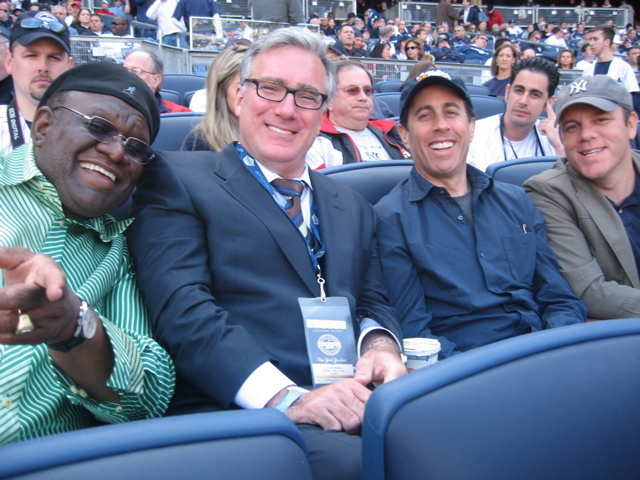 Marie Olbermann is survived by her husband – my Dad, by my sister Jen and her husband, and their two kids, Jacob and Eve – Mom’s grandchildren. She’s survived by her cousins Robert and Bill Schlumbohm, and their families; by just about everybody in baseball… and… by me. Good night, Mom, and good luck.